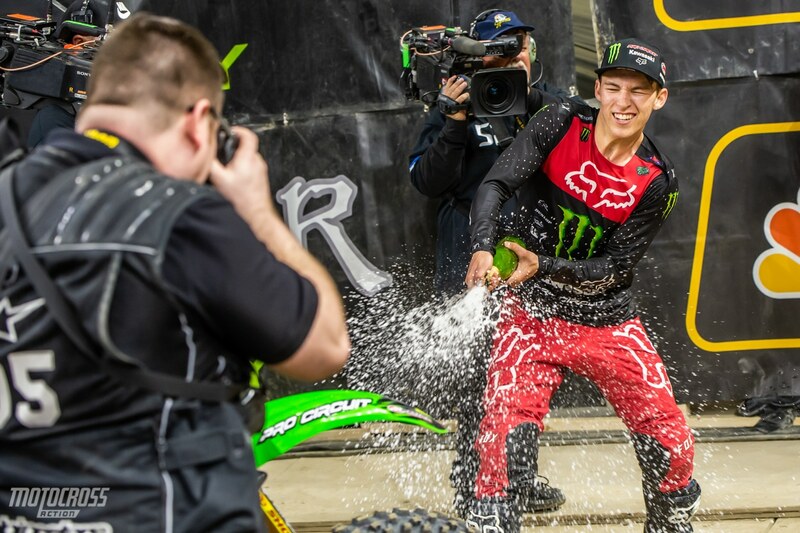 Austin Forkner popping the champagne after his last win in Indianapolis. 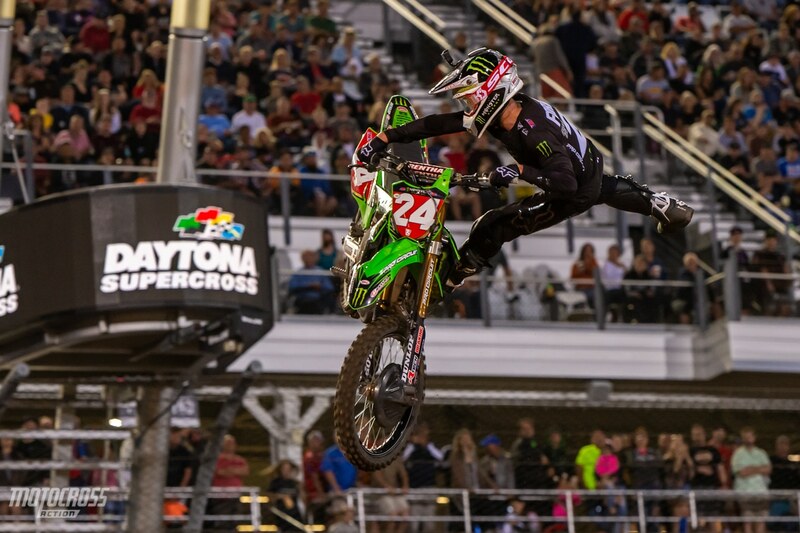 We all knew that Monster Energy Pro Circuit Kawasaki rider, Austin Forkner would be a stong force this year. But I’m not sure we thought he would win every East Coast round. Of course, there are a few rounds left, but with his winning ways, its difficult to imagine him not winning his first AMA Pro Championship. We caught up with Austin post-race in Indy to hear what he had to say. AUSTIN, WE TALKED BEFORE THE SEASON THAT THIS SCENARIO COULD HAPPEN; WHERE YOU ARE DOMINATING THE 250 EAST COAST SUPERCROSS SERIES. Obviously, I did not think that I would win five out of six races so far, and be third in the other one, but I am happy that I have a good solid points lead. I mean, I could not really ask for more, just my riding is solid, and on point. I am really happy with my riding. I am happy with my mentality, and my maturity after the past couple of years. I am just sitting in a good position right now, and I am really happy. IT APPEARS THAT EVEN WITH PRACTICE OR QUALIFYING MISHAPS, YOU ARE ALWAYS READY FOR THE MAIN. Yes, that is it. You always want the perfect nights, be fastest in qualifying, win the heat race and win main event, but tonight was the first heat race that I lost all season long. I crashed pretty hard and got ran over, so it would have been easy to dig myself in a hole. In the past I may have over thought it, but I was just like “it does not matter, I was the fastest in qualifying. If I get a good start and put myself up front, I am going to make it happen.” So, on the start, I made it happen, and I was just clicking it. Austin has ben undefeated by the east coast racers. 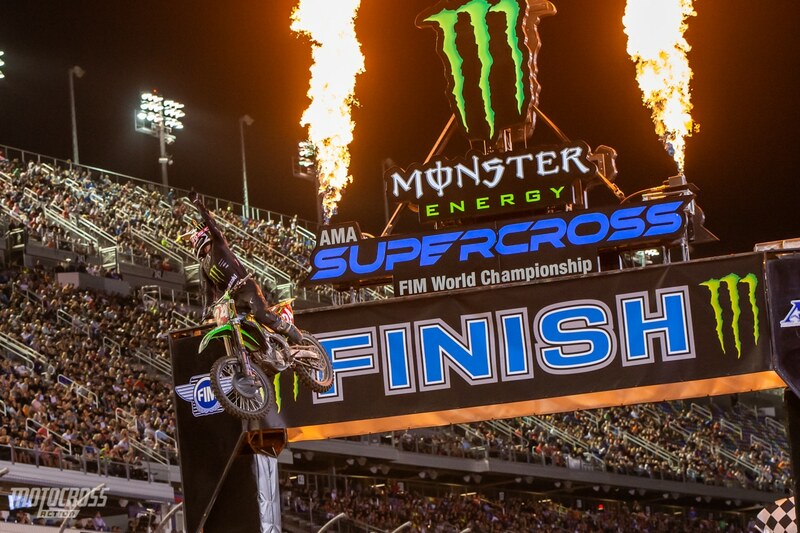 He won the prestigious Daytona Supercross this year. BY THE END OF THE RACE IN INDY, YOU HAD GAPPED CHASE SEXTON. My last lap was obviously slow. I just wanted to be cautious because I knew I had a gap, so no reason to do anything crazy, but he caught me a little bit the last lap. I could see. Obviously, I was not looking behind me, but I could see him in rhythm sections. I was monitoring him, just wanted to keep us all at a gap, and keep pushing forward. I wasn’t going to worry about the guys behind me, and just keep hitting my lines every lap, because that was definitely key tonight. The whoops were pretty tricky, jumping through them, doing that solid every lap. The ruts were sticky, so every rhythm, every lap I just kept clicking them off. OBVIOUSLY, YOUR TEAMMATE ON THE WEST COAST, ADAM CIANCIARULO IS LEADING THAT SERIES, BUT HE HASN’T DOMINATED LIKE YOU HAVE. There are a bunch of arguments of what coast is harder, blah, blah, blah, but last weekend, in the East-West Shoot-out, they finished 1st and 2nd, the West Coast guys. But then the East Coast guys finished 3rd, 4th and 5th. It is hard to say. There are always debates of what coast is harder. It is always going to be like that. People just want to find something to talk about, I guess, but I don’t know. It does not really matter, and I don’t really care, honestly. I am racing East Coast and they are racing West Coast. I could not care less about what those guys are doing until I come to race them. At Atlanta, they were a little faster than me, but I was like “I am not racing them for the championship, so no reason to”. I believe I could have run their pace, but it would have been a bit sketchy to do that, so I was just going to let them have it, try to maybe learn something from them, and just move on. You know, I was a little bit bummed, but I still did not get beat by an East Coast guy, so that was me thinking championship a little bit. 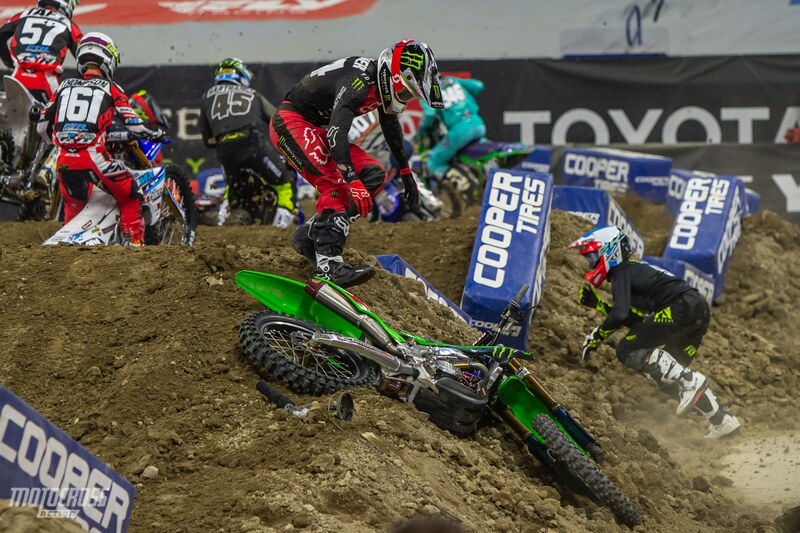 Forkner crashed in his heat race in Indy and got ran over. It was the first heat race he lost all year. TECHNICALLY YOU FINISHED 3RD, BUT FOR ALL PRACTICAL PURPOSES YOU WON. I guess you can argue that the West Coast guys might be a little faster, but the East Coast guys are more consistent, you know. Who cares really? I am focused on me. Until I get to outdoors, I don’t have to race those guys. We do have Las Vegas, and that race a couple of weeks ago in Atlanta, but that is the past and as far as I am concerned, I am racing for this championship. I go up to the gate and I line up and whoever lines up next to me, I try to beat them. It is as simple as that, and I have done that five out of six races this year, so it has been solid. FINISHING UP, IS THERE ANYTHING SPECIAL YOU ARE GOING TO DO WITH THIS THREE WEEK BREAK? Ride some Outdoors, and just not think about the Supercross series. Not get too comfortable, and not settle, because it is not over yet. I have a comfortable lead but got three more races to go. I’ll obviously relax and enjoy the break, but do not settle is going to be the key.